9-year-old Abigail DeAngelis of West Chester, PA, stood proud with her sign at the March For Our Lives rally in Philadelphia, Saturday, March 24, 2018. Dozens of Members of Congress have been invited to attend town halls addressing gun violence on Saturday. But none of the congressmen invited to attend two Philadelphia-area forums are expected to attend. March For Our Lives, a student-led activist group formed in response to the school shooting in Parkland, Florida, has organized more than 120 "Town Hall For Our Lives" forums across the United States. The group did so with the assistance of the Town Hall Project, an initiative that promotes congressional forums. U.S. Rep. Pat Meehan, R-Pa., was invited to attend a forum organized by Lower Merion High School students. The event will be held at 1 p.m. Saturday at Ludington Library in Lower Merion – with or without Meehan. The congressman, who will not seek re-election after facing accusations of sexual misconduct, has not yet accepted an invitation, according to the Town Hall Project. His office did not respond to a request for comment. U.S. Rep. Frank LoBiondo, R-NJ., was invited to attend a forum at 2:30 p.m. Saturday in the Mullica Hill Library in Mullica Hill, Gloucester County. The event was organized by Indivisible West Jersey, part of a Democratic-led activist group aimed at resisting President Donald Trump. LoBiondo has not accepted an invitation, according to the Town Hall Project. His office did not respond to a request for comment. 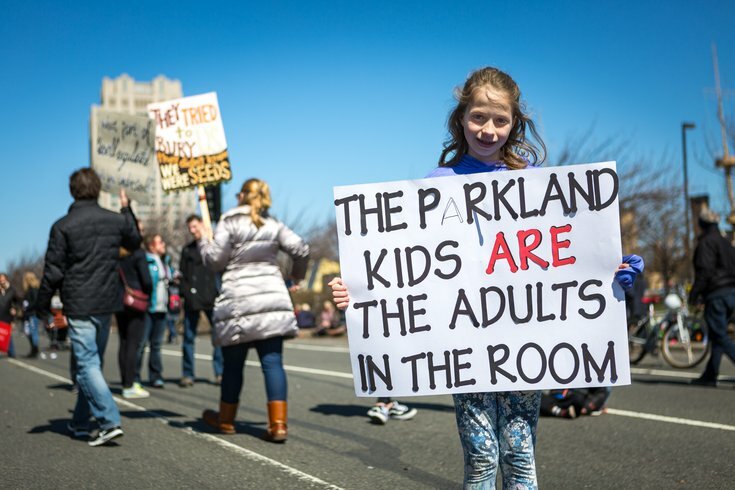 There are six "Town Hall For Our Lives" forums being held across Pennsylvania on Saturday, but only one – the event in Lower Merion – is in the Philadelphia region. Likewise, there are five forums being held in New Jersey. Sen. Pat Toomey, R-Pa., was invited to attend a forum in Chambersburg, Franklin County, but cannot attend due to a personal scheduling conflict, according to his press secretary, Steve Kelly. Five years ago, Toomey crossed party lines to co-sponsor a bill that would have strengthened background checks after the mass shooting in Sandy Hook, Connecticut. He did so again in March, when he co-sponsored bipartisan legislation that would alert state law enforcement when someone attempts to purchase a firearm but fails a background check. Late last month, Toomey tweeted that he hoped lawmakers could find "common ground" on the issue. Sen. Bob Casey, D-Pa., also is unable to attend any of the multiple town halls to which he was invited, according to his communications director, Jacklin Rhoads. Casey called for greater gun control measures following the shooting at Marjory Stoneman Douglas High School. He addressed students at Cheltenham High School and participated in two marches late last month. "Senator Casey is in favor of and has voted for: universal background checks, a ban on military-style weapons, limits on the sizes of magazines, which contribute to mass shootings, and prohibiting those on Terror Watchlist from possessing firearms," Rhoads said in an email. Sen. Robert Menendez, D-N.J., who had federal corruption charges dropped earlier this year, will attend a forum in Ridgewood, Bergen County. It is unclear whether Sen. Cory Booker, D-N.J., is attending any related events.